CIRCACINCO is an ensemble that was founded in 2009 in the womb of Academie De Kunstbrug in Ghent. The musicians played together for the first time on a teachers concert, rather by coincidence… but there was a click. What’s more, there were musical sparks. A cooperation could not fail to occur and a new tango-ensemble was born! 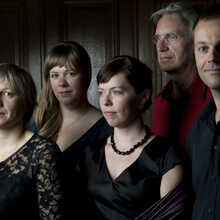 Bart, Michael, Patricia, Sarah en Tine are five musicians on piano, german flute, accordion, guitar, cello and contra bass. Five classically schooled musicians who kind of love some musical adventure. CIRCACINCO brings work by Astor Piazzolla, the Argentinian ‘enfant terrible’ of tango. Music without all too many compromise, sometimes hard and raw, but just as often sensual and soft.